You want New Year’s Eve to be special, you want to create memories that will last throughout 2018. Make new friends, celebrate with old ones. And there’s nowhere better to do that than a village pub. Celebrate the turn of the year with a fabulous six course dinner, plus canapés and fizz on arrival, and coffee and petit fours to ensure you end the evening with something to keep you awake enough to see in the New Year. And whether you join us for dinner or not, party like there’s no tomorrow with our “80s requests” playlist from 9pm until midnight and beyond. Get your requests in early, and play ‘guess the year’ while we play your favourite 80s hits. 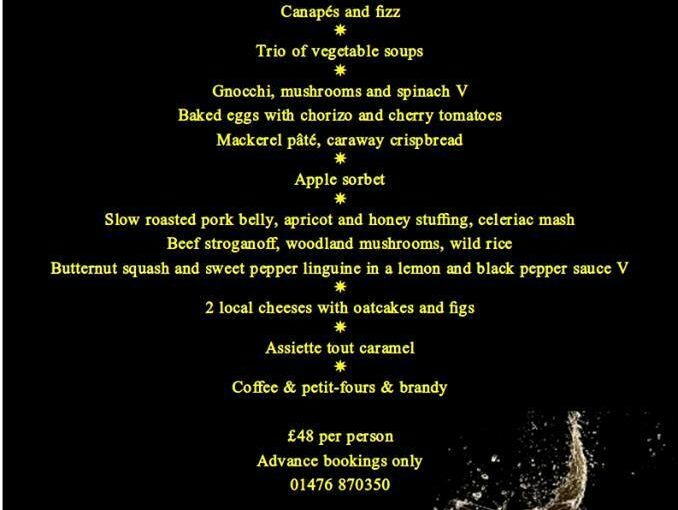 Dinner is just £48 per person. And whether you eat with us or not, you’re welcome to see in 2018 with our 1980s ‘request’ playlist, from 9pm until the early hours of January 1st. There will be no door charge, no cover charge, no hidden extras or inflated prices just because it’s New Year’s Eve. Leave all of that stuff behind in the town centre where it belongs. Just come to the pub, make friends and have fun. Sorted. A limited number of rooms are still available for Bed and Breakfast, bookings to be made by telephone on 01476 870350.